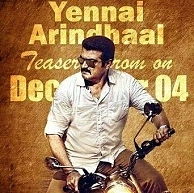 It was widely reported earlier that the music rights of Yennai Arindhaal were bagged by Eros Music. However, late yesterday evening it was announced officially that Sony Music South will be releasing the big album. Sony Music South, via their official twitter page, tweeted, "Extremely excited and proud to be associated with Gautham Menon again! #YennaiArindhaalSonyMusic". This last minute change came as a big surprise for fans, media and the trade alike. It is to be noted that Sony Music and composer Harris Jayaraj have maintained a fruitful relationship. All of the composer's previous albums - Anegan, Yaan, Idhu Kathirvelan Kadhal, Endrendrum Punnagai, and Irandaam Ulagam - have been released by Sony Music. And, Yennai Arindhaal will only further their association. Ajith's prior albums such as Mankatha (2011), Billa 2 (2012) and Arrambam (2013) were also released by Sony Music. This will be the 4th consecutive year when a 'Thala' album would be released by the renowned music label, which is acclaimed as the market leaders here down South. People looking for online information on Harris Jayaraj, Thala 55, Thala Ajith, Yennai Arindhaal, Yennai Arindhaal Sony Music will find this news story useful.